Auto Service Specials Washington | Orchard Chrysler Dodge Jeep Ram " "
Every Friday at Orchard 50 Years and Older Receive 10% Discount on Parts and Labor! Coupon not valid with any other offer. Must present coupon before service inspection. Limit one coupon per person. Coupon does not apply to prior purchases. Does not apply to tire purchases. Other Restrictions may apply. Service includes machining of front or rear rotors, cleaning and lubrication of caliper slides, inspection of brake hydraulics, and brake pad replacement with genuine Mopar© Value Line pads. Not valid with any other offer. Must present at time of purchase. Limit one per person. Does not apply to prior purchases. Most vehicles qualify. Other Restrictions may apply. From deals on OEM tires to great discounts on brake service, you’ll save big with auto service specials at Orchard Chrysler Dodge Jeep Ram. While our service center in Washington, Michigan, offers already competitive prices for maintenance and auto repair, dealership coupons take the bottom line even lower. Shop service specials and schedule a service appointment for quality auto repair at the dealership. At Orchard Chrysler Dodge Jeep Ram, we honor your schedule with early bird drop off, shuttle service, and free WiFi. Not only will you save precious time on your next oil change, chassis lube, or battery test at our no-appointment Mopar Express Lane, you’ll save money, too, with Mopar coupons for car maintenance and genuine Mopar parts from our parts department. 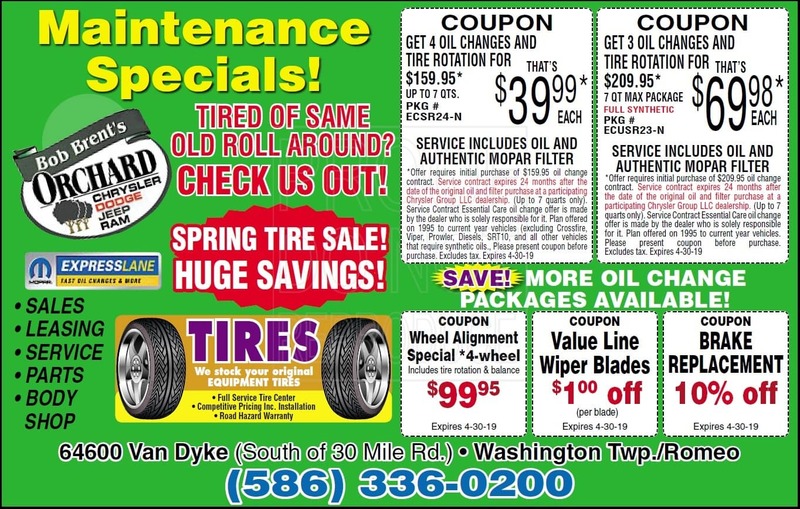 View the latest service specials and drive in to see us for auto service in Washington, MI, today! If your current vehicle is beyond Washington, MI, car repair, check out our used inventory of reliable vehicles at Orchard Chrysler Dodge Jeep Ram. Value your trade and apply online. The auto finance department at Orchard Chrysler Dodge Jeep Ram will make it happen.